This is one of those recipes that I was skeptical about. Its blend of spices didn’t exactly sound appealing to me, and Jeremy has commented before that he doesn’t understand the combination of lamb with mint. But I wanted something easy and pantry-friendly, and it had enough rave reviews on Epicurious that I gave it a shot despite my reservations. 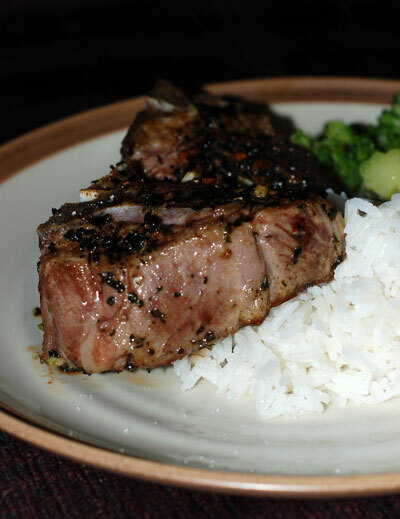 I’m very glad I did, because I’ve since made it several times, and I think it is safe to say that, in a slightly adapted form, it is now my go-to recipe for lamb chops when I’m stumped for other inspiration. The original recipe calls for broiling the chops. My oven’s broiler setting is very sketchy, so I adapted it to what works best for us. I don’t currently have fresh mint on hand (it didn’t survive the winter or the energetic shepherd pup in our backyard), but I substitute in dried mint to good effect. Finally, I’ve made these with and without the cayenne, and I have to say that we find the heat very distracting in this particular application. If you want to use the cayenne, I would recommend not letting the rub stand on the meat for more than a few minutes. Place olive oil, chopped mint, minced garlic, salt, cumin, coriander, cayenne pepper (if using), and black pepper in small bowl; mix well. Spread herb mixture over both sides of lamb chops. Transfer chops to broiler pan. Let stand 10 minutes.